In sepia and in full colour photographs is the story of York Pullman, the Yorkshire bus company founded in 1926 and like the name suggests associated with the City of York. The book features an introduction and a brief company history before going on to describe stage routes from York and how they developed. It then deals with the Stage Bus Fleet from 1960 to 1985 when the fleet was sold. 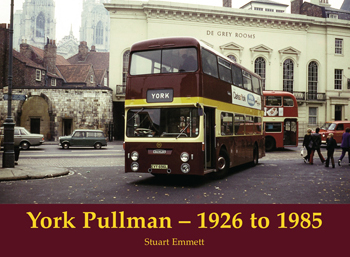 Incidentally, the name York Pullman was revived in 2007 by K & J Logistics but that’s another story� Our book is written by a bus enthusiast who is patently passionate about his subject so other bus people will not be unhappy with his approach. The book also has enough pictures of lovely old buses and scenes about Yorkshire that it should appeal to those interested in local history.